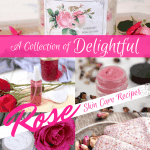 You are here: Home / DIY Skin Care / How to Make Perfume with Essential Oils: A Complete Guide with DIY Perfume Recipes! 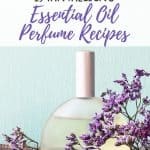 How to Make Perfume with Essential Oils: A Complete Guide with DIY Perfume Recipes! Ready to learn how to make perfume with essential oils? 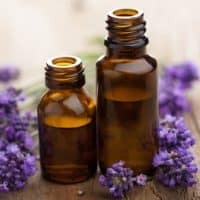 Skip the synthetic fragrances which are full of yucky ingredients, and try one of these DIY essential oil perfume recipes. They smell absolutely beautiful, and are 100% natural using essential oils to create a unique perfume blend! When you think of perfume, you probably think of the beautiful, expensive bottles of cologne found in the drugstore. And while they may smell lovely and look attractive on the dressing table, the ingredients you’ll find in them can be harmful. But did you know you can create an equally beautiful, homemade perfume using natural essential oils? Thanks to their incredible therapeutic and scenting properties, these oils have been used for thousands of years. In fact, the use of essential oils dates all the way back to ancient civilization. Egyptians used them in smoke during religious ceremonies, believing the fragrance would bring them closer to the gods. 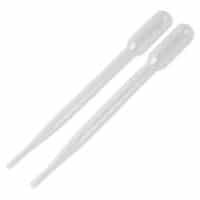 They began storing them in containers for both cosmetic uses and medical aids. And there’s no denying the science. Essential oils do have incredible health-boosting powers – helping to reduce stress, boost energy, and even reduce discomfort. Health benefits and a beautiful scent in one bottle? To me, it’s a no-brainer! Why should I learn how to make perfume with essential oils when I can just buy it at the store? What most people don’t know is that while synthetic fragrances last a long time and smell amazing, most of the compounds are derived directly from petrochemicals. These chemicals and toxins are known carcinogens – that means they have the potential to cause cancer and birth defects. They can even cause hormonal trouble. Whenever you use a synthetic perfume or a product containing ‘fragrance’, these mysterious toxins are absorbed into your bloodstream. There’s no use checking out the ingredients on the back of your favorite perfume. 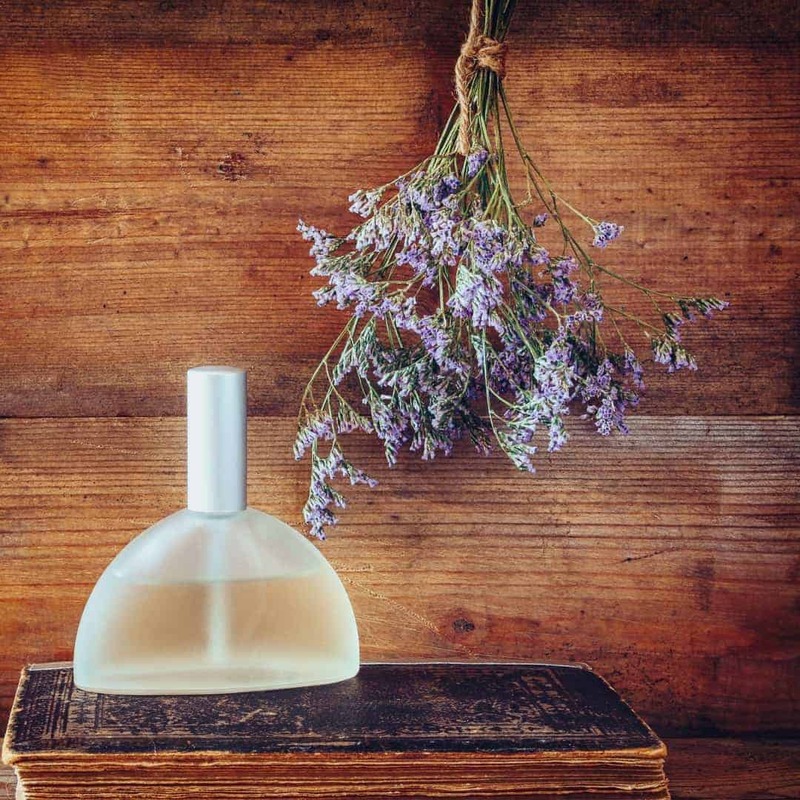 In order to keep scent formulations secret, brands are legally allowed to keep selected ingredients off the list – that means you’ll never know what's truly lurking in that bottle. Yep, it’s as crazy as it sounds! Essential oils, on the other hand, are 100% natural, safe and non-toxic to the body (unless you’re allergic to one of the ingredients). Let’s have a closer look at the incredible benefits of making your own essential oil perfume. Making your own essential oil perfume is fun, and you can’t go wrong with that! You’ll be creating and blending your own formula – so you can be sure your fragrance doesn’t contain any nasty pesticides, toxins or chemicals which could be absorbed into your bloodstream. 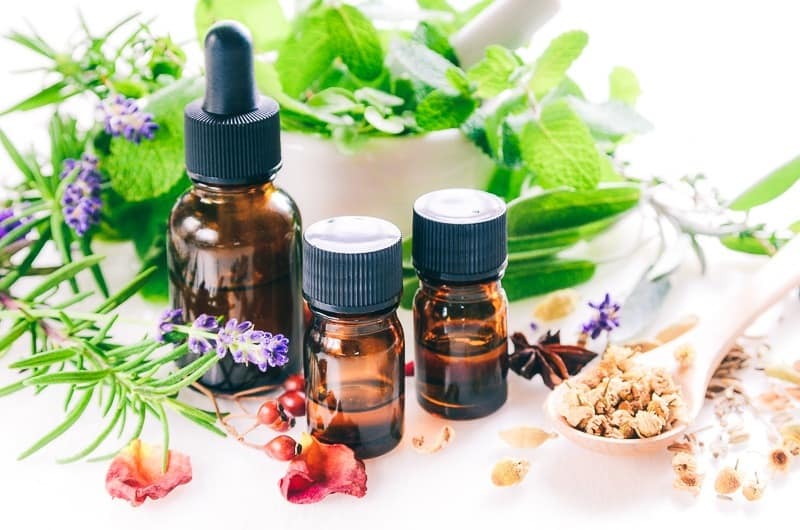 If you find that synthetic fragrances can trigger headaches or allergies, it’s highly unlikely that essential oil perfume would do the same – so you can smell amazing without side-effects. As essential oils come from the natural oils in plants, they’re easily absorbed and can help to soften and nourish the skin. Synthetic fragrances do the opposite and could actually dry out or irritate your skin, especially if it’s sensitive. Creating a perfume using natural essential oils can bring emotional and physical benefits. Whether you need something calming, mood-boosting or energy-enhancing, there’s an essential oil for you – which we’ll discuss next. There are hundreds of essential oils and each comes with unique therapeutic benefits. I’ve picked a few of my favorite essential oils (though there are many more!) which have amazing scents and great benefits for you to consider including in your essential oil perfume blend. Lavender Essential Oil – A fresh, flowery, herbal scent which can help reduce anxiety and emotional stress. Struggle to get a good night's rest? Lavender is well-known to relax and improve sleep. Rose Essential Oil – A strong but beautiful, sensual scent which is said to balance hormones, fight depression and uplift emotions. It’s even said that rose essential oil can help lift the pain of a broken heart! Patchouli Essential Oil – An earthy, rich scent which is known to be incredibly grounding and stabilizing on the emotions, making it a good option for those experiencing high levels of stress. Orange Essential Oil – An energizing, fresh scent which is famed for its mood-boosting ability. 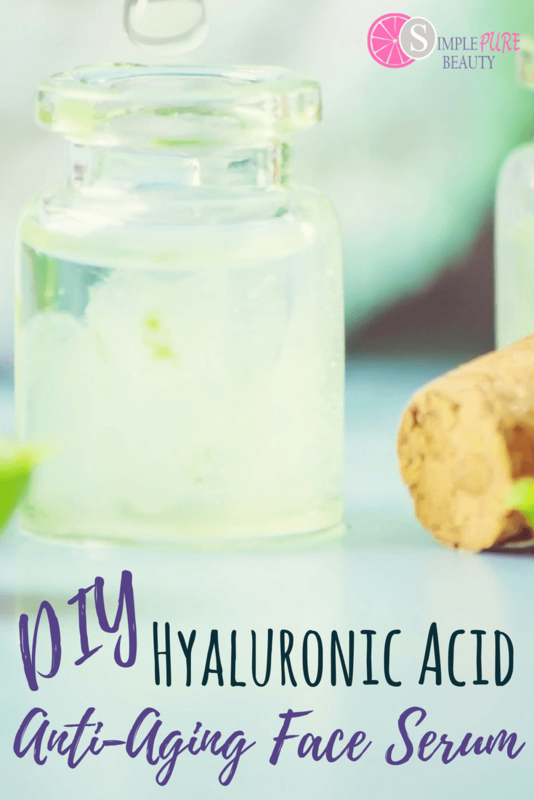 It’s believed to be able to turn off the stress hormone cortisol and is useful during stressful periods or as a daily remedy for those who suffer from anxiety. Jasmine Essential Oil – A unique, exotic scent which can help you sleep deeper and stop snoring (yes, this one might be useful for your husband!). It’s also useful for those going through the menopause – with the potential to balance hormones and ease mood swings, fatigue, and nausea. Bergamot Essential Oil – A very light, citrusy scent which manages to encourage normal cholesterol levels and blood sugar – though researchers aren’t sure how just yet! Bergamot is known for its calming effects, too, so is a good choice for those struggling with anxiety or depression. Ylang Ylang Essential Oil – An uplift, calming floral scent which is an effective remedy for hypertension (high blood pressure), as well as boosting mood. Neroli Essential Oil – Distilled from the orange blossom, Neroli is one of my favorite essential oils. Not only does it smell heavenly, it has many anti-aging benefits for the skin as well. 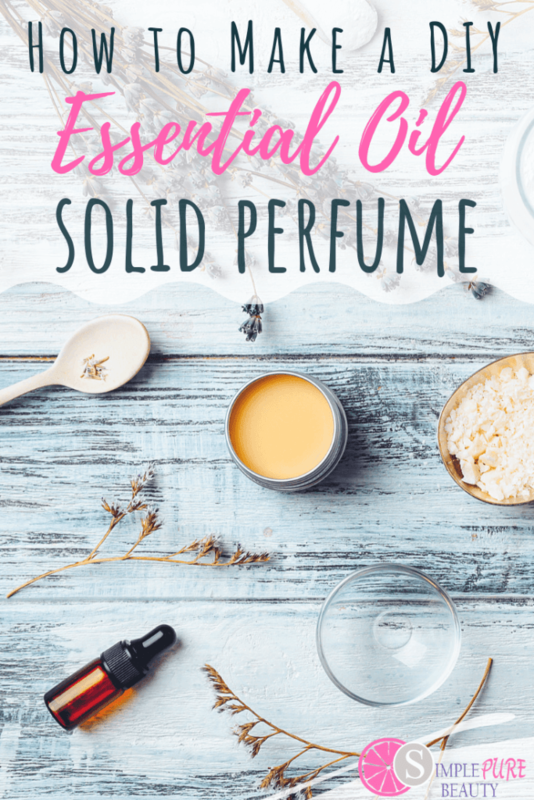 Before I dive into all the different methods of making your own essential oil perfume, it’s important to understand how scents (in this case, essential oils) actually work together. A perfume is normally made up of two or three levels – top notes, middle notes, and base notes. 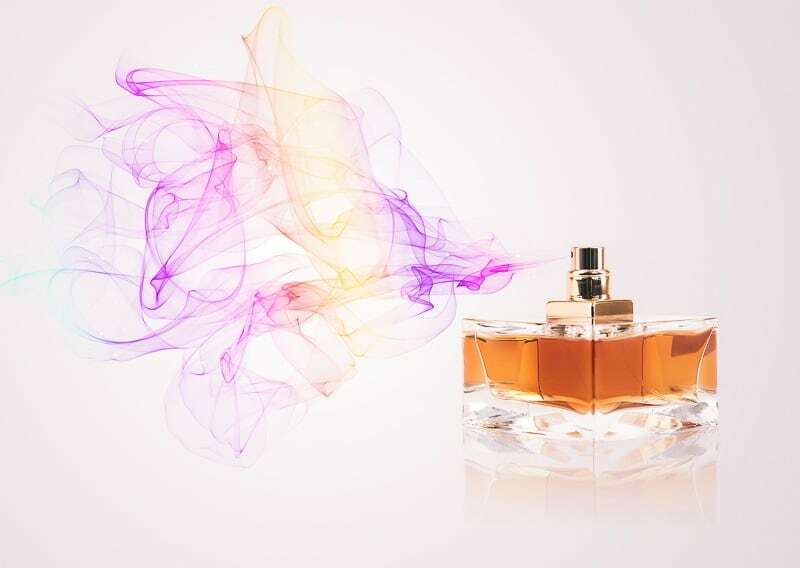 TOP NOTES (lavender, lemon, orange, bergamot, grapefruit etc) are the first thing you smell in a perfume and are usually very light scents which fade away quickly. MIDDLE NOTES (ylang-ylang, rosemary, jasmine, cinnamon etc) are the core of the fragrance and develop right after the top notes. They shouldn’t be too overpowering. BASE NOTES are musky and powerful (cypress, cedarwood, patchouli, ginger, sandalwood, vanilla etc) and help to extend the longevity of middle notes. Over the course of the day, you’ll notice the scent changing and blending into the base notes – it’s actually really beautiful! So there are multiple ways to make homemade perfume and we're going to go over all of them starting with Perfume Oil. 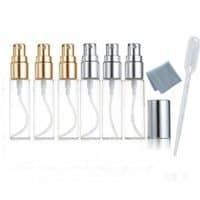 This is one of the easiest ways to make your own perfume and is so convenient when you add it to a roll-on bottle to create your own roll-on perfume. Perfume Oil is easy to make and requires just a few minutes. Gather a few of your favorite essential oils and blend them together to create your own customized homemade perfume oil. To make 10ml of perfume oil, we’ll be going by the 50/30/20 essential oil blending rule. This means you’ll use a ratio of 50% base note, 30% middle note, and 20% top note, roughly equating to 6 drops base note, 4 drops middle note, and 3 drops top note. Add the essential oils to the bottle using a dropper, starting with your base note and working up. Make sure you smell your blend as you go along and adjust the quantities to suit you - this method is completely customizable. Pour in your carrier oil until the bottle is full. Put the lid on and give the bottle a good shake. Leave the oils to infuse for a couple days - yep, patience is key here, but it makes all the difference! So there is another fun way to make your own perfume and that is creating a solid perfume. 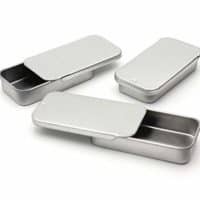 Not only is solid perfume super easy to make, it’s also portable and great for taking on vacation. It lasts for a while as well, thanks to the beeswax. Solid Perfume is very easy to make and handy to carry with you. 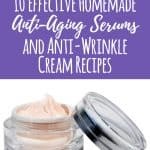 This solid perfume recipe will be your new favorite! 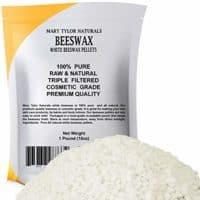 Melt your beeswax pastilles and coconut oil. If you have a double boiler, use that - but you can also create your own by resting a bowl over a pot of water on a medium heat. After the mixture has cooled, stir in your essential oils using the 50/30/20 ratio as a guide - 10 drops base note, 6 drops middle note, and 4 drops top note. 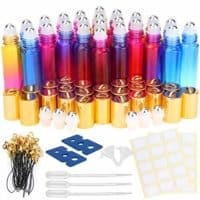 It starts hardening pretty quickly, so be fast! Put the mixture into your container and put it in the refrigerator straight away, until hard. Enjoy - your solid essential oil perfume is ready to go! 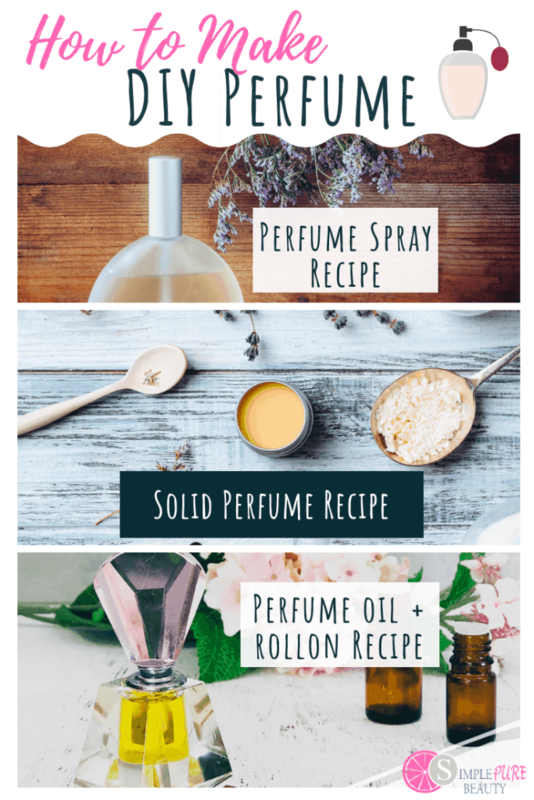 If you prefer a refreshing, perfume spray over stronger, traditional perfumes, then you’ll love this easy DIY essential oil perfume spray recipe! I love essential oil body sprays for a cooling, rejuvenating spritz on a hot day or after a long day at work. 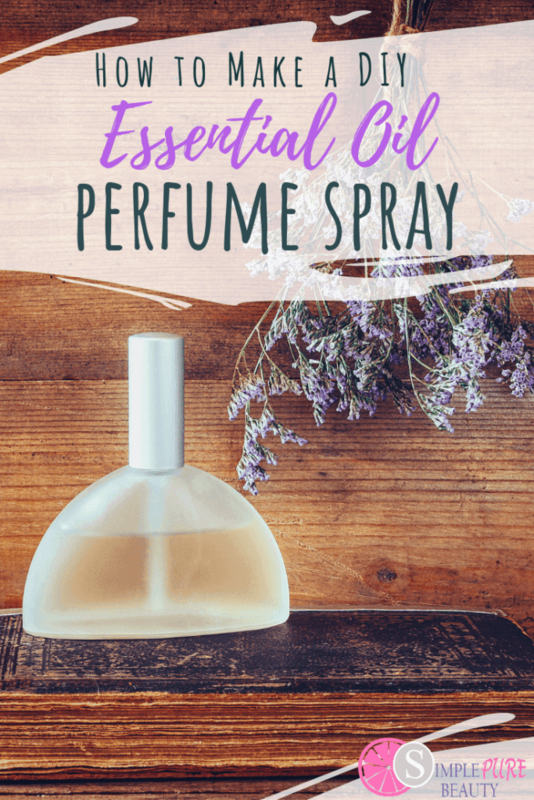 For those who prefer a more traditional perfume spray recipe, you're going to love this essential oil perfume spray recipe! Fill with grape/corn/wheat high proof vodka for an eau de toilette. Let sit for at least a week to marry the aromas together. 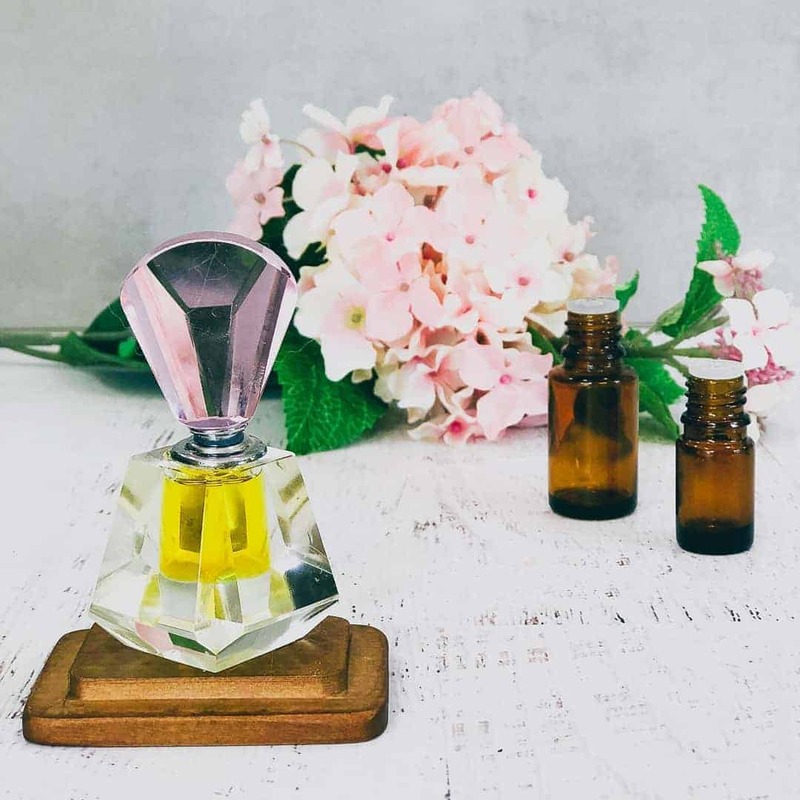 I can guarantee you’ll love the beautiful scent and the impressive health benefits of switching from synthetic fragrance to an essential oil perfume. But the one thing you might notice and wish you could change is the longevity. Admittedly, synthetic perfumes do tend to last longer, but that’s because they’re, well… synthetic! Synthetic perfumes are filled with chemicals and toxins which are designed to help the fragrance stick to the skin. And okay, that’s great and all – but we’ve already discussed the health risks associated with these ingredients – and it’s just not worth it. Keep your perfume out of the heat – Direct sunlight and heat can cause top notes in your DIY essential oil fragrance to break down quickly, even when it’s in the bottle. Store your perfume in a dark cupboard – and if it’s a particularly hot day, pop it in the refrigerator for a while. 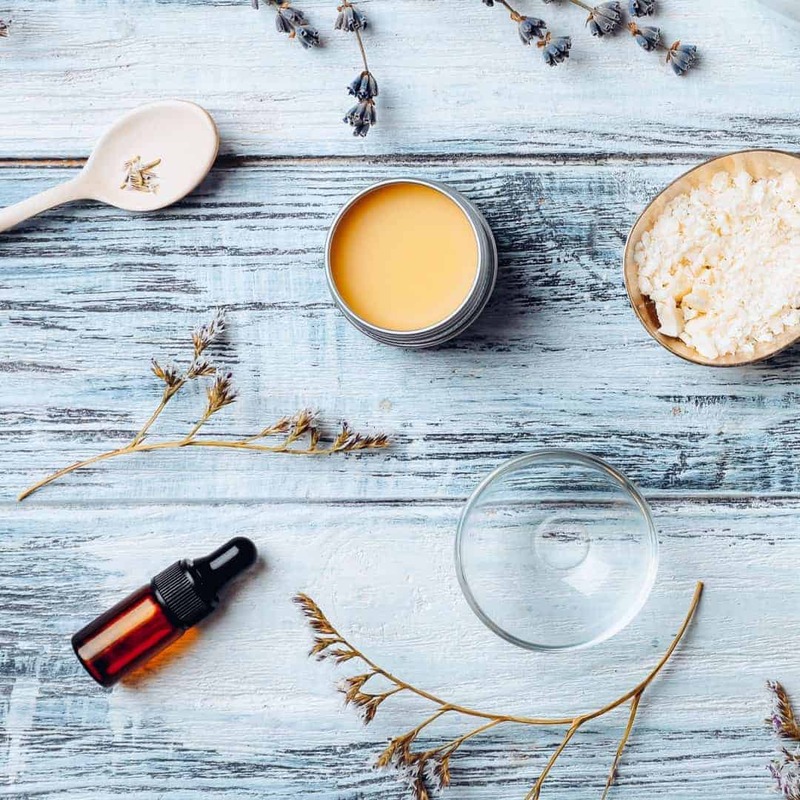 Moisturize first – Get in the habit of using a fragrance-free, oil-based moisturizer on your skin before applying your essential oil perfume or body spray. If you’re in a rush, just apply a small amount where you’ll apply the perfume. Dry skin doesn’t hold a scent well, but moisturized skin has the potential to hold it for 30% longer. Get layering – It sounds simple, but boy does it work! 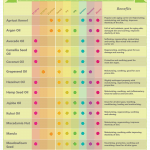 Pick your favorite essential oil blend and create several products with it. Shower gel, perfume oil, body spray, hand cream… you get the gist! Go further than your pulse points – Okay, so pulse points are good (temples, below the ears, inside the wrists and elbows, etc) but only applying your essential oil perfume there could lead to it breaking down earlier due to the warmth of these areas. Go crazy and put your perfume everywhere – a spritz on your hair, on your collarbone, or whether else you’d like. Avoid rubbing – It feels natural to first spritz and then rub your wrists together – but stop right there! Rubbing can actually encourage the top note to evaporate quicker, leading to a lower longevity. Just spray and give the scent time to settle into your skin. And that’s it for my guide to DIY essential oil perfume! Natural perfumes are so beautiful, surprisingly easy to make, and way better for your health – give them a go and I can guarantee they’ll win you over in no time! Thank you for such an informational blog post! 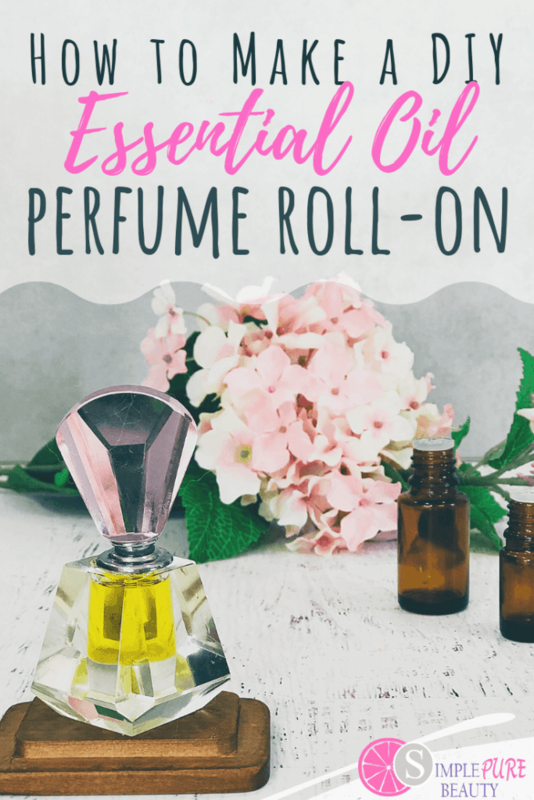 I’ve made some essential oil perfumes in all three ways you’ve outlined and I love using them all. It’s a lot of fun and they don’t irritate my son’s asthma! Win-win!